WhoCrashed offers several options which allow you to change the behavior and aspects of the program. To access the options panel, select Tools from te main menu and then Options. NOTE: the Home edition of WhoCrashed does not allow you to change these settings. This stops Windows from deleting memory dump files in case there is less than 25GB of disk space available. Check out this MSDN blog article for more information. Crash dump timestamps are recorded in GMT. Enable this option if you would like crash dumps time stamps to be presented in your local time according to the time zone in which you reside. If your system has crashed many times and you have many crash dump files available on your system it's a good idea to not include all of them in the analysis. By selecting a value here, you can limit the analysis process only to the latest crashes that have occurred on your computer. 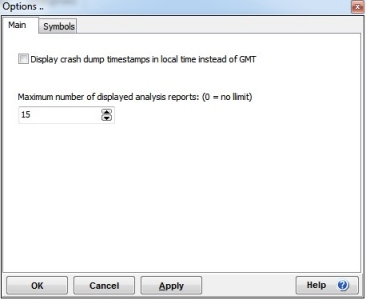 Select this option to enable symbol resolution when performing crash dump analysis. With symbol resolution enabled, the dump reports generated will be much more accurate and contain more valuable information. With symbol resolution enabled, chances of finding the culprit driver are better than with symbol resolution disabled. However symbol resolution may take a long time to complete, crash dump analysis will be faster with symbol resolution disabled. 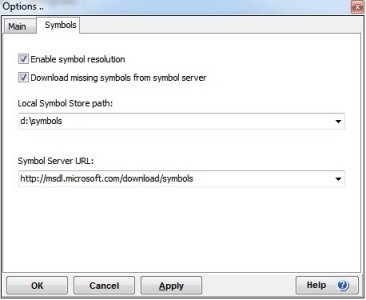 When enabled, missing symbols from your symbol store will be downloaded from the symbol server that has been specified below. If this option is disabled, only the local symbol store will be used. You can change the local symbol store to any directory on your hard disk. Symbol store on remote servers are not supported. If you have your own symbol server, you can specify its address here. Most often the standard Microsoft symbol server is used. Page generated on 4/19/2019 12:16:23 AM. Last updated on 5/9/2017 11:27:20 AM.